It’s almost impossible to fault this standard Cambodian-style guesthouse with simple, spotlessly clean rooms and super-helpful service. 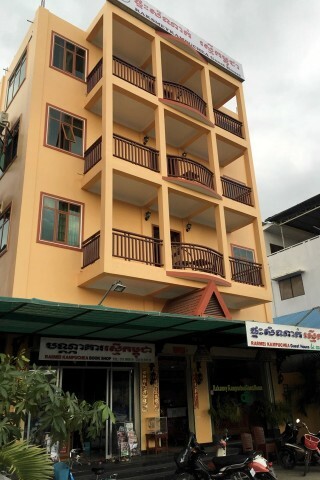 Just opposite the drop-off for the Giant Ibis bus service, Raksmey Kampuchea is only five minutes’ walk from the riverside, but has prices that are miles apart for simple, unadorned rooms that will meet anyone’s basic needs. The staff could not have been more approachable, professional and helpful, and spoke excellent English. The rooms all come with hot water, and flat screen TVs with cable. There’s no bar or restaurant, though with dozens within an easy walk, that’s not a loss, though they do have fridges in the lobby selling drinks. It’s not the most salubrious of spots, but if you’re looking for a decent place from which to explore, and can’t spring for something on the riverside, then you’d be hard pressed to do better.